A new day begins in Florence, and the gardens of the Boboli beckon as they always do on my first day in the city. There are few people out after this morning’s bristling May shower. The political and artistic heart of the city, the Piazza della Signoria, is but a short walk from the most famous bridge in the world, the Ponte Vecchio. The offices in the ancient Palazzo della Signoria face a square that contains masterworks of art, cafès and many of the city’s most successful and well-known businesses. Outside the Cafè Rivoire, jacketed waiters sweep remnants of rain from a wooden deck and iron-black stone patio in preparation for another busy day. Across the square a young man pushes a four-wheeled cart full of who-knows-what up into the center of the Piazza and begins to open his stand for the day’s business. High up in the facade of the palazzo a window opens. A well-dressed man leans out to face the brisk fresh air of morning with a stretch and a long look across the open space at his feet. For innumerable morning Florentines, Tuscans, Italians, have started their days like this. As I stroll in front of the fountain of Neptune on this late Spring morning, I think of the millions who have visited here, recall the many writers and artists whose feet have walked up on this lively stage. Vaporetti, the water buses of Venice, course the water of the Venetian lagoon deep into the night. The night schedule of the vaporetti is known as the “N” schedule. I board one of these floating buses on the Grand Canal near the train station. Away from the bright lights of the piazza, the city walls, dark and ominous, appear above water as smooth and silvery as mercury. We float past great gray ghosts of churches. Large phenomenal shapes, carved from some sculpture’s vision, cast high shadows against arched marble. A full moon pulls the tide achingly high. Boats, tied to the shore, bow low in the water. Some appear close to sinking. Another vaporetto appears along our right side, a lead-colored reflected vision that moves ahead of us, spirit-like. Light from the linen-white moon illuminates reflections of the boat in the canal. In windows high above, candlelight warms the walls within palazzi. The great expanses of facades that line the canal are interrupted, here and there, by smaller waterways. They offer tempting glimpses of Venice’s darker shadows, places into which, from our route on the N line, we are not permitted to see. Venice doesn’t live in sunlight. When the throngs of people who fill these canals with the necessary commerce of the city are all gone, Venice groans back to its true life. Tourists, full of hope, have made this city what they think it should be, not what it is. In the midst of the night, masked ghosts appear in windows. The ephemeral voices of the Doges who once governed the Venetian republic whisper around the arches of palazzi. Ghosts of dead lovers gather again to stand in dark corners along the canal, wistfully and silently watching as mortals float past. This is their city. We interlopers breathe the air in which they lived. With a longing smile, they flick a small particle of dust from a tomb, or a fleck of history from atop an old monument. We inhale it, and it stays with us for the rest of our lives. 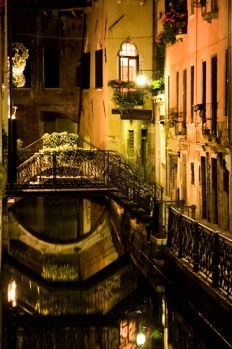 The particle lodges in our souls and when the simple word “Venice” comes to us, we remember a night such as this. Mark’s tour is the best in the world. If you want to see Italy the way few people ever do, GO WITH PRIVATE ITALY TOURS!! We traveled with him in 2008 across northern Italy and Tuscany. Unforgettable and a remarkable trip.